The popular SystemRescueCd is a handy rescue disc you can use to troubleshoot downed Linux and Windows systems. 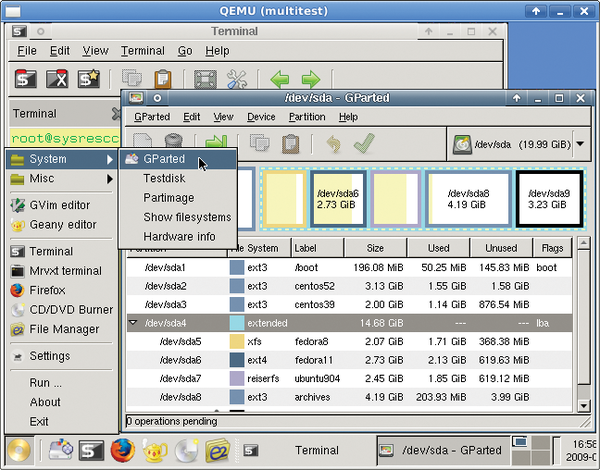 Unlike larger troubleshooting distros such as Knoppix, which attempts to provide a complete Linux user environment on disc, SystemRescueCd prides itself on simplicity. A smart, lean collection of testing and rescue utilities will help you check hard drives, restore system files, test the network, and troubleshoot hardware. Slip SystemRescueCd into your computer's CD tray and reboot. See the project documentation for helpful information on boot options. SystemRescueCd's toolset includes GParted, ddrescue, and FSArchiver. Use NTFS-3g for accessing Windows NTFS partitions, check system memory with MemTest+, and troubleshoot network problems with a full complement of Linux network utilities.